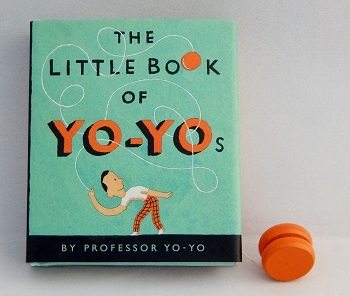 A miniature yo-yo reference/trick book (71 mm x 13 mm x 81 mm), by Professor Yo-Yo (aka Stuart Crump) and illustrated by Greg Clarke. Released in early 1997 around the start of the last great yo-yo boom in North America and Japan. Published by Running Press Miniature Editions in the USA. Hardcover with dust jacket, 128 pages. Also included a miniature yo-yo bookmark on a string that was attached to the book's spine. Original retail price: $22 US.